When investing in large household appliances and fixtures, use the government's Energy and Water Ratings (stars) to guide you to the most efficient products to save money. The cost of energy and water is rising and the effect is increasing. Large household appliances (including fridges, clothes dryers and dishwashing machines) and toilets, taps and showers consume the bulk of our household energy and water. The Federal Government's Water Rating site notes that replacing a single-flush toilet with a water-efficient dual-flush system will reduce household water use by around 1000 litres per year, as well as saving $50 each year over the life of the system. Similarly, the product comparison charts in the Federal Government's Energy Rating site shows that the difference in the ongoing operating costs between an average family fridge (two-door, 300+ litre volume) with an Energy Star Rating of 2½ and a similar fridge with an Energy Star Rating of 5 (out of 6) is between $750 and $1,000 over a 15 year period, depending on use and the cost of electricity. Start thinking medium to long-term and invest more now to get the most energy efficient appliances and fixtures. You'll reap the environmental and financial benefits for years to come. When you're in the market for large appliances and fixtures use the 'star labelling system' to inform your understanding of the operating costs of your home. Energy and water ratings and consumption measures. 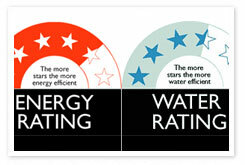 Both the Water (1 – 6 stars) and Energy (1 – 10 Stars) Rating systems use a combination of a star rating system and an energy/water consumption estimate to determine the efficiency of the appliance or fixture. An energy use comparison table of all the products in the above categories is available, with more information about the energy labelling system, on the Energy Rating site. A water use comparison table of all the products in the above categories is available, with more information about the water labelling system, on the Water Rating site. Campaign to have the energy and water labelling programs expanded. Both of the above rating programs don't cover the full range of products available. Campaign for these programs to apply energy labels to all products used in the home. As well, request that the current labels are extended to indicate the embedded energy and water of a product (i.e. the energy and water required to manufacture the product), which would allow you to view the full environmental impact of your purchase. The modern demand for Flat screen TV’s is huge, and as the screens get larger and larger, so too does the energy usage, making some TV’s one of the most energy consuming appliances in the house. Generally, but not always, LCD TV’s are more energy efficient than plasma TV’s. This is especially true when they include the LED back projection technology that consumes one-quarter to one-third the power of an equivalent sized LCD flat screen. When buying a TV it pays to check the power in watts on the label on the back of the TV – the higher the number the faster it consumes energy - 150 watts or less is low in consumption. Also look out for an energy star label. This is different to energy-rating label for most household appliances. It shows you that you can set the TV to automatically go into sleep mode and/or that it uses reduced power in stand-by mode. Many appliances including TVs may still be consuming energy even when they are switched off. While this can be convenient, standby mode can make up to 10 per cent of your household energy use. Switch off appliances at the wall. While not all appliances can be switched off, switching off a computer overnight can save an enormous amount off your energy bill and reduce greenhouse gas emissions. Rebates for installing efficient appliances. Check our Rebates and assistance page for government rebates for installing energy efficient appliances and fixtures. Science is telling us that we need to live more sustainably. To do this we must aspire to the efficiencies found in nature. This action is intended to help people understand the lasting benefits of sustainability and to be informed when purchasing energy efficient appliances and products. Global warming, droughts, dead river systems and species extinction are all results of our overuse of natural systems and their consequent decline. A major factor in rescuing the effects of our consumptive habits is our ability to develop and broadly deploy more efficient technology. Reducing the amount of energy and water needed to support our households is a powerful way to ease this pressure on our precious natural systems. A stable global environment and the availability of fresh water are central to human health and prosperity. Clean, fresh water from the tap is, for most people in the world, a luxury. As the Australian water supply is stretched, recycled and sterilised at the expense of our waterways stagnant rivers, we expose ourselves to toxic algae, chemically treated water and an increased vulnerability to severe drought. Many people across the globe are not so lucky, and a lack of clean water and associated diseases kills tens of millions of children each year. So use water wisely, and conserve this precious resource.